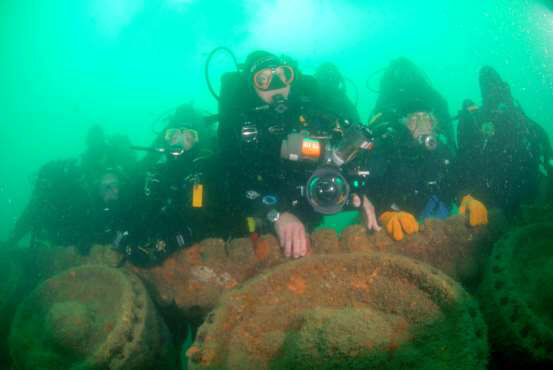 Members of Southsea Sub-Aqua Club frequently dive along the South coast of England and have dived much of the rest of the UK and around the globe. The pages linked below provide some useful information for both club members and visitors, as well as samples of what our members have done or are doing. Each year we publish a year planner that members can download. We also have a calendar which members can use to easily add dives and events to their own electronic calendars. For the latest information about the club's activities, please see our Facebook page. Each year our members go on club trips for a weekend, long weekend or perhaps a week or two to a variety of places. Sometimes one of the group will write a diary or a little report which we can then publish. They contain a variety of pictures and often a little humour too. Some of the items relate to a project and the activities of the team too. Various reports about some of the many projects that the club has run or been involved with over the years, many have received awards. These pages contain a mixture of the final reports, a reflection of the planning and videos, where available. Some projects have featured in the press and where possible links to those articles are also included. Our galleries show a few of the photos taken on some of the dive trips and projects.